Brian Donohue of Ledger Live, a self-described centrist, describes how attending Congressman Frank Pallone’s Red Bank Town Hall on Health Care changed his mind about health care reform. Check out :55 seconds in. See the guy in the blue tee shirt? He’s the guy I talked about in my diary, The Crucible yesterday. Whipping the room into a complete incoherent frenzy. Anything those people are against, I should be for. And check out 5:23! Donohue captures a lady outside, manic, wild-eyed, and wailing about the Death Plan of Obama. The Senator’s connections to NJ, from Berkeley Heights’ Mary Jo Kopechne, to later electoral victories here. Monmouth U.’s poll put this #1 on voters’ minds. Are the candidates addressing it? Christie’s 2005 speeding ticket in Lambertville leaves us scratching our heads and counting the unanswered questions. Something does not add up. Congressmen Rush Holt and John Adler hosted events yesterday. Essex County, with its history of political corruption, looks at ethics with the Newark Special Agent in Charge at FBI. NJ-12’s man in Congress strongly supports smart public transportation. Tonight’s County Committee meeting is the first since Chair Rick Perr resigned, and the county party hit the roller-coaster. Health and school officials met in a summit to plan for H1N1. How to continue education if schools are closed? Best practices for keeping parents in the loop. It’s coming. Millviille: A public transportation activist takes a petition to a Freeholder candidate when she doesn’t like the response from NJ Transit officials. Wildwood: Mayor and Commissioner will go to court to hold off a December recall vote. Bridgeton: A small community of homeless men is living under the new Broad Street Bridge. Springfield: Appoints David Barnett to fill an empty seat. Gloucester County: Getting $2.1 million smackeroos for energy efficiency. Morris County: following ‘n friending. Lacey: Oyster Creek nuclear power plant is leaking contaminated water. Near the naked beach: Sandy Hook reopens after a chlorine gas leak. Phillipsburg: The state of healthcare in the state, on the table. Piscataway: Police sergeant charged with lying about overtime. in praise of a tomato. Last night’s Health Care Town Hall with Frank Pallone in Red Bank was at once a magnificent exercise in democracy, and an unsettling display of ignorance and free-floating right-wing resentments – abortion, “illegals,” guns – spilling out of people willing to treat politics as sport, and shout down all comers. A few people came with intelligently-expressed questions, support, or objections. But last night was owned by the loons. It all spun down to rabble early, and it almost never let up. In 1953, Arthur Miller wrote a play about the 1692 Salem, Massachusetts witch trials, his allegorical commentary on his own time, when when HUAC and Senator Joe McCarthy manufactured enemies of ordinary Americans. Sitting there last night, I was reminded of The Crucible. In it, Abigail Williams is the teenager who whips the girls around her into a frenzy, shouting out wild accusations, utterly taken by the passion of the moment, and completely manipulated by a girl acting in her own self-interest, and willing to ruin peoples’ lives. When another girl, Mary, is about to prove her a fraud, she whips her friends into a delirious panic, screaming they’re freezing, that Mary has bewitched them. Within moments, Abilgail’s cries are the girls’ cries, and they are all screaming the same word. It’s a neat trick. Last night’s Abigail Williams was a man in a light blue tee shirt bearing the date the next Congress is seated. His were the words that rifled around the room, in seconds. And it was all stupid. To a woman fearful of losing her house to medical bills: Good! Lose your house! Lose your house! House! House! Houuuuuuuse! When Margaret Mead was mentioned: What part of the jungle did you come from? Kumbaya! Kumbaya! Kumbayaaaaaaa! When a mother tried to say how her disabled daughter and mentally disabled husband were dropped by their insurance: His fault! He couldn’t fill out the form because he’s an idiot! idiot! idiot! I wish your mother believed in abortion, Frankie! 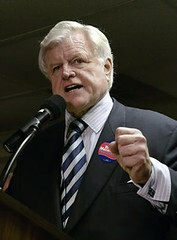 And this: Is Ted Kennedy dead yet? Real objections – and support, and questions – about the public option were drowned out by a mob certain they had no power and so determined to flex it, and so sure their rights to “the First Amendment” were being taken, that they made certain no one else could be heard. The Lion of the Senate is dead. He died tonight, at the fabled Kennedy compound in Hyannisport, MA, the little group of grey shingled buildings that fueled some of the dreams, and some of the frustrations, of more than one generation of his countrymen. He was a complicated soul, responsible for great tragedy, yet hero to so many, the beneficiary of tremendous privilege but workaday, approachable and productive in his service to his country. There is too much irony wrapped up in this. Health care access was “the cause of his life,” he said. And, having just returned from a marathon public event where I saw an earnest Member of Congress abused for nearly 5 hours by an unruly mob, it all feels endangered to me. Fragile. Simply said, Frank Pallone could have used Ted Kennedy standing beside him tonight. He’d been laying the groundwork for this, for decades. And if it’s to be done now, it will be done without its prime mover. Frank Pallone took questions about health care reform in an increasingly heated room for more than 3.5 hours last night, at Piscataway Municipal Hall. Overhead lighting was harsh and the room filled to capacity, with people standing eight deep in back, and down both sides. So many, that Pallone ran 3 full sessions, emptying out each time for a new crop of people. Each session, its own rhythm. The first had the most organized agitators from the teabag movement. Their antagonizing started outside, even before the doors were opened. Section 2, the most substantive questions – on both sides – and people willing to listen to the answers. The weary third session – most people waiting hours hours to get in – the largest, and the most concerned with preventive care, and with the side issue of abortion. It was also the only session with many young people. I was glad to see them show up. Particularly given this, noting that young Obama supprters are AWOL from the health care fight. And that’s messed up. This is signature legislation from the Obama era and change still needs the life, drive and energy of young progressives. Most of the people walked into the room with opinions gelled, looking for that microphone. Pallone, even-tempered even when the room got shouty, sometimes veered into the wonky. Substantive questions were on mental health parity, fraud prevention, impact of public option on the deficit, and impact on the disabled. But those were high points. Cuckoo. Liars. Nazis. Socialists. “He hasn’t even read the bill!” You heard this, too. People angry, mistrustful of government, certain they’re getting bamboozled. A stunning number expressing complete indifference to people without care. I expected misperceptions, even deliberate misdirection. Got that. I wasn’t prepared for so many of the anti-reform agitators fully believing that what HR 3200is, is single-payer health care. Make the distinction more effecitvely between the public option and single-payer. Dial down the anger (both sides, I hope).Get me some young blood. And then, maybe we got ourselves a ballgame. Pallone has another Town Hall TONIGHT 7pm, Red Bank Middle School, 101 Harding Road, Red Bank, 07701. Rush Holt’s is Wed 7pm: Middletown Arts Center, 36 Church St., Middletown 07748. John Adler’s Wed 4pm: Energy Expo, Burlington County Inst. of Technology, Westampton Campus, 695 Woodlane Road, Westampton, 08060. And Adler needs your help on a course correction. Rick Perr resigned last night. after Vice Chair Alice Furia and Freeholder Chris Brown, among others called for him to step down after this story broke. Rob Andrews and Frank Pallone held marathon public sessions last night on health care reform. We posted Courier Posts’ live stream of Andrews and I’ll write about Pallone’s this morning. Christie hosted a conference call for reporters to push his latest meme that Corzine is a big Wall Street trader who’s sold out the state. Surprise … that’s not what reporters wanted to ask him about. Oh, and Christie doesn’t like the “fake hysteria” he’s seeing about his unreported loan to Brown. NJN’s Zachary Fink made some very interesting discoveries about Chris Christie’s neighborhood. Corzine and the Assembly Dems name their team, with Congressman Frank Pallone in the lead for the governor. Says it’s unfair that 3 states can have it and we can’t. Frank Lautenberg is joining the effort to keep Moammar Gadhafi out of Englewood. The GOP is targeting the district, but Asm Gary Schaer’s outraising. A U.S. Dept. of Justice investigation finds the hospital unsafe, and not delivering adequate treatment and rehabilitation to its patients. An Atlantic City councilman gets into a pretrial intervention program. And wants to build 106 wind turbines in Delaware Bay. I’m the candidate. I’m out here. The Corzine campaign just released a new video, produced in-house, which underscores the point that Chris Christie’s had some trouble with the cascading evidence of questionable conduct he engaged in as United States Attorney for the District of NJ, and questionable ties he still maintains to that office. And would rather avoid chatting about it just now. My own opinion: red meat for the cognoscenti, but might scare off undecideds. I think people need to hear – every way possible and from all angles – what he did. That’s the meat, the substance, the muck of the muckraking. Harsh, unflattering video that underscores that he’s avoiding talking about it – which has some truth – may turn a lot of people off, and reinforce perception that the campaigns can’t tell the difference between muck and mud. But that’s my 2 cents. What’s your opinion? Will Moammar Gadhafi be bunking in Englewood? He’ll be speaking at the UN, right after Obama, alongside General Assembly president Ali Triki, Libya’s former foreign minister, and may stay in a house owned by his government. Rep. Steve Rothman wants to prevent it. A civilian band of brothers, who never served, unite in memory of a friend to help out returning vets. Cory Booker’s Twitterfeed figures into the story, too. When you’ve built your campaign persona on ethics and corruption-fighting, it’s hard to readjust quickly when it turns out your record’s rife with hypocrisy and questionable conduct. New York Times, and AP look at the race. Moments after Trenton Councilman Manny Segura harshly criticized Chris Christie for his statements on Sonia Sotomayor and immigration, a fight broke out in the crowd. What if you had to build a new boardwalk? What would you build it out of? Charting the changes in its government over the last weeks. “Just get it out of here.” – $22 million in federal stimulus money goes to cleaning up a waterfront Superfund site. A report surfaces that Bernie Madoff is dying of cancer. Rumson’s old town hall is torn down. (Ignore the ad that starts the vid). A high horse is a difficult thing to ride… Star-Ledger has some Questions for Chris Christie. Daily Kos picks up on the question asked by Loretta Weinberg: Why is Michele Brown involved in the FOIA request? Keith Olbermann calls shenanigans on Chris Christie. Zeroing in on the LG candidates, in a state with a recent history of needing fill-ins. Chris Christie calls Jon Corzine a “liar” and “reprehensible”, after being called out on the facts of what his no-mandate promise really means in NJ health care. Emails obtained by Burlington County Times seem to have caught Chair Rick Perr and former Treasurer David Meyer in a credibility gap. This should make Burlington Dems meeting Thursday – to pick a new Treasurer – very interesting. Will Coniglio get less time? Labor and legislative leaders have advocated for it. Asm Patrick Diegnan Jr. looks for a way to curb use of illicit cell phones inmates use to secretly communicate inside, and to intimidate witnesses and direct drug deals. A state-run program program provides lawyers and federally certified housing counselors to help New Jerseyans keep their homes. NJ’s cracking down on unlicensed dentists, some with rusty tools, old car seats for dental chairs and soda bottles for your spit. If we learned anything during the Bush administration, we learned pattern. How loyalty was rewarded over competence, how fact is shaped around a fixed policy when the truth lies somewhere else, how Bush made sure his friends got richer. It’s a pattern. And so it is no surprise to many of us here – and most in the country by now- that Tom Ridge now reveals the Bush administration tried to force him to raise the country’s terror alert level just in time for the 2004 Presidential election vote. Ridge, Bush’s first Secretary of Homeland Security, describes mounting tension in the White House as Attorney General John Ashcroft and Defense Secretary Donald Rumsfeld pushed him to do what was clearly politically expedient for a President facing re-election. Ridge withstood that pressure and did not raise our terrorist threat level. He refused to play politics with our national security. And in fact, the following month he resigned. In Christie, I think we have someone considerably more willing to cooperate. This is the way George Bush behaved as President. How he led. With Karl Rove firmly in command of our his direction and strategy, too many national decisions were made with political self-preservation at the fore. These are the names that emerge in a picture of how a smart but inexperienced Freeholder, who could not get re-elected, kept his federal job when less-cooperative US Attorneys did not. 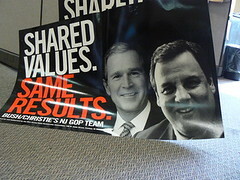 What price did we pay for Christie’s loyalty to the Bush White House? What did Christie do for them, to keep his job? Or, is he such an unthinking partisan they didn’t even need to pressure him? How did Chris Christie get off the list? George Bush used the Department of Justice – Christie’s workplace – to investigate hundreds of Democratic elected officials, at a rate of 7:1. They changed the electoral map, hauling in few of their own party. It’s the way these people operate. It makes a person wonder what Christie knew about the timing of the July political corruption sweep. Were events shaped to help his political future?